The equipment in this series is specially designed for the periodic charging and recharging of energy storing capacitors. Charging voltage and charging current can be set independently of each other. For very large capacitors with voltages up to 150kV, whose charging times are a few minutes and which require charging power of up to 200kJ/s, the HNC series will be the right choice. This series is designed in a corresponding way to the HNT series of equipment. When a high level of precision and a high repetition rate are needed, the HSC series will be of use. This series also deals with voltages up to 150kV, with charging power of up to 50kJ/s. This series is designed in a corresponding way to the HSR series of equipment. For voltages up to 50kV, with charging powers from 500kJ/s to 30kJ/s. 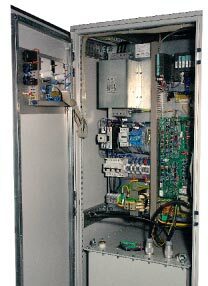 various capacitor charging units from the ALE series can be used. These models are good value for money and available at short notice.